In a single gesture, the Cattier Organic Biphase remover removes all traces of makeup, even the most stubborn and waterproof! Its two-phase formula offers effective and gentle removal at once. Thanks to its natural assets, it is suitable for both eyes and lips. Rich in cornflower floral water with decongestant virtues and floral water of organic damask rose, it soothes the delicate and delicate skin of the eye contour and brings freshness. 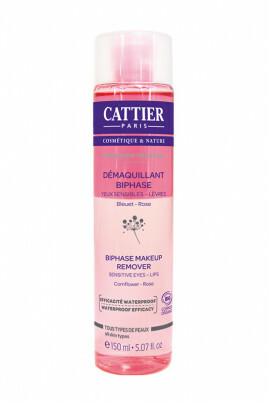 With Cattier Organic Biphase remover with a fluid and non-greasy texture, your skin is clean! Ophthalmologically tested, it is suitable for the most sensitive eyes and lens wearers. Shake the bottle before use to mix the 2 phases (aqueous and oily). Soak organic or washable cotton then remove your eyes by sliding gently up and down. Use another cotton to clean the lips. Rinse if you feel the need. Aqua, Dodecane, Glycerin, Diglycerin, Squalane, Sodium Chloride, Aloe Barbadensis Leaf Extract*, Rosa Damascena Flower Extract*, Helianthus Annuus Hybrid Oil*, Centaurea Cyanus Flower Extract*, Simmondsia Chinensis Seed Oil*, Lithospermum Erythrorhizon Root Extract, Citric Acid, Benzyl Alcohol, Potassium Sorbate, Sodium Benzoate.